How would you feel if you lived every day of your life as someone who fits the media description of a terrorist? What would this do to your mental health? In playwright Jonas Hassen Khemiri’s Chicago premiere of I Call My Brothers at Interrobang Theatre Project, we witness a 24 hour reality that is all too familiar to people of color. Under the direction of Abhi Shrestha, this play aims to amplify the experience of brown folks demonized and policed based on their appearance. The drama begins after the city of Stockholm is shaken after a car bomb explosion. Amid the chaos, who is other in this society becomes clear. Our Arab-Swedish protagonist Amor (Salar Ardebili) attempts to go about his daily errands, but is succumbed by paranoia, guilt, and self-hatred. There’s an echo: the bomber wasn’t him—but it could have been. Through flashbacks Amor is humanized as a quirky nerd; his best friend Shavi (Chris Khoshaba) is a welcomed sidekick among bullies. But we also learn of a more insidious trait, one that cannot be ignored and does much to challenge our empathy as an audience. Shrestha directs from a place of care and bravery. Upon starting the show, time and space are given for a land acknowledgment, in Arabic and English. This signifies Shrestha’s desire for accountability and inclusivity, and both are necessary for this play as it navigates brutality and shame. Though the set is bare, save for a bench, a chair, and a movable light fixture, we are greeted with two pieces I can only describe as art installations. One takes the form of graffiti, interrogating “What do you do when the wind howls?” The other is a wall lined with dangling scarf-shaped aluminum sculptures, mimicking those of each of the characters. 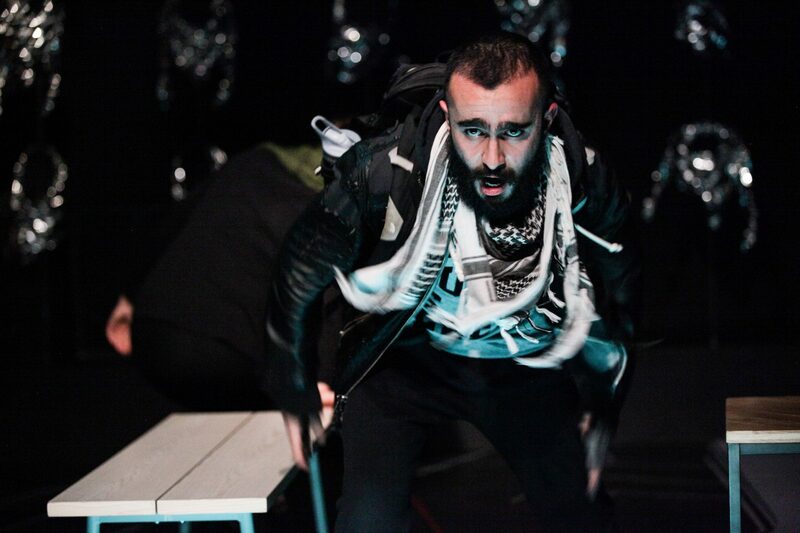 Eleanor Khan’s scenic design does much to amplify the importance and danger of keffiyehs—the scarves and hijabs that adorn the characters and the wall. When coupled with the versatility of a movable LED light about the length of a crowbar, metaphors of liberation shine through. However, the question “liberation for whom?” echoes in my head as Amor’s longtime friendship with Valeria (potently played by Gloria Imseih Petrelli) proves him an outright stalker. This relationship is not complex, it’s dangerous. Amor spirals into tropes I’d hope this modern new play would reject. He treats the other women in his life no better—making and breaking promises, indulging fits of rage and aggression. Ardebili does much physical labor which keeps us grounded as Amor runs through the city, a portrait of unrest and anxiety fueled by adrenaline. Though flashbacks render time and place difficult to track, his character offers an unexpected rootedness. Yet, the moments of beauty are ultimately tainted by an underbelly of toxic masculinity and the perpetuation of harm against women enacted by men (of color). This hit me hard, and more questions of intention versus impact surfaced as I struggled to keep my eyes open due to the violence. With the lack of brown and Black stories on stage, Amor becomes a sort of everyman. His experience becomes the experiences of brown and Black folks being followed and targeted based on misguided perceptions. Though no human is perfect, Amor does so much harm in a position he never wanted. There are moments where bits of Amor’s past are offered, but they lack the exploration and potency to justify the person he has become. Additionally, there are no consequences for Amor’s behavior. Is it worth uplifting an abuser as an everyman? Though this work champions stories of people we rarely see, I’m hard-pressed to advocate that this play gets it right rather than harmful. Here normalization toes a dangerous line. It leaves me with a final question, but not one relevant to the obvious strengths of the design team and cast—how do artists check each other on what pushes our cultural conversation forward rather than backward?